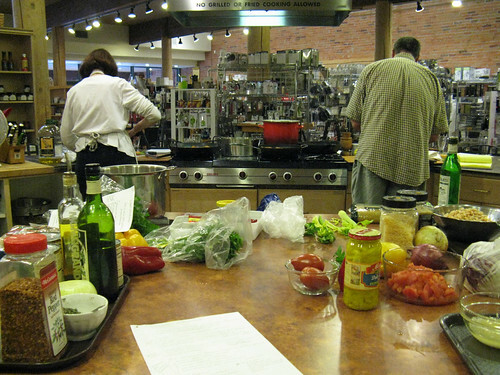 The day after I got back from the conference, we were scheduled to volunteer at Gretchen’s Cooking School. I was so exhausted I was afraid I wouldn’t make it through – fortunately, even though the class was by Peter Belknap, it wasn’t too much work to keep up with. He was doing Tuscany (each of his classes focuses on a different country), and the food was very straightforward and rustic. He didn’t dirty nearly as many dishes as he usually does! And I can absolutely guarantee that nobody left hungry. 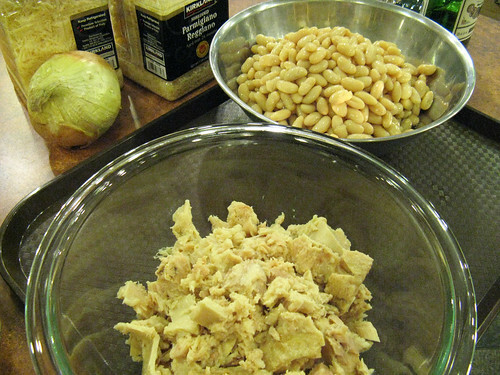 The first course was a salad of oil-packed tuna, cannellini beans and mixed vegetables, with a dressing of mustard, vinegar, mayonnaise and the oil from the tuna cans. 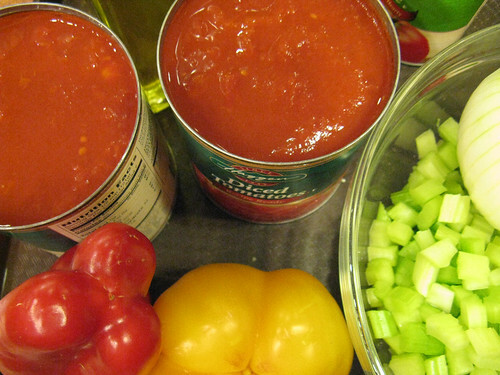 Among other things, it involved seeded jalapenos and an entire jar of sweet pickled peppers, to give it just a hint of a kick. 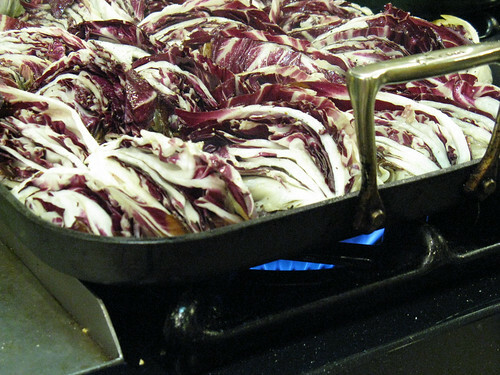 The salad was spooned over tomato- and garlic-rubbed toasts and wedges of grilled radicchio, then drizzled with olive oil. 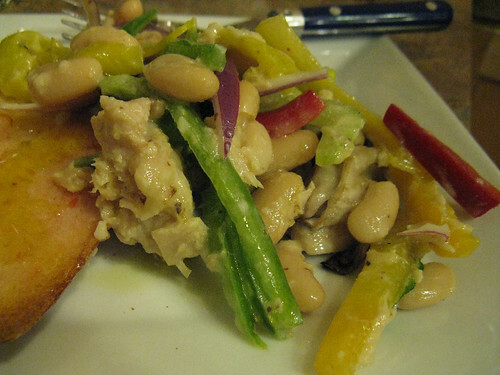 The flavor was bright and fresh, but it was a very solid and filling dish. 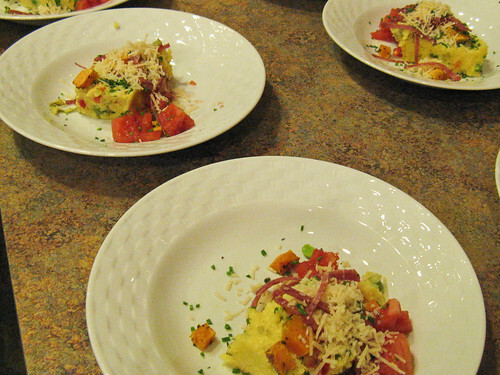 Polenta soup came next. It wasn’t at all like a soup we had a while back, made by Casey Schanen from Nell Thorn, where it was basically a winter greens soup slightly thickened with polenta. 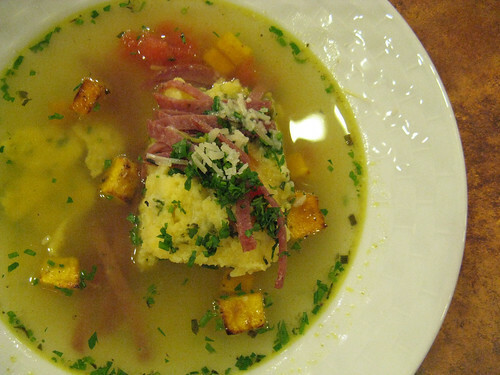 Instead, this was a hearty broth ladled over slabs of cooked and cooled polenta, with additions. 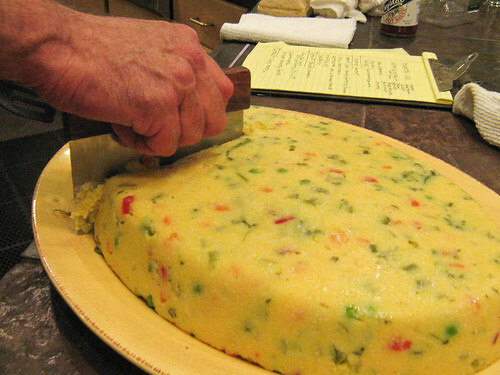 The polenta itself was pretty traditional (slowly simmered, lots of stirring) except for having lots of vegetables cooked directly in it – broccoli raab, carrots, peppers and fresh shelled peas, so that the finished polenta was studded with bits of bright color. 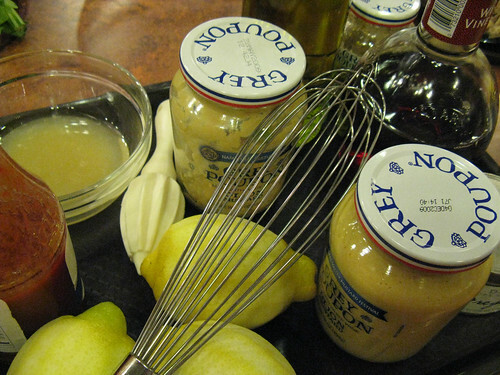 We poured it into a casserole and refrigerated it briefly, then unmolded it onto a platter. 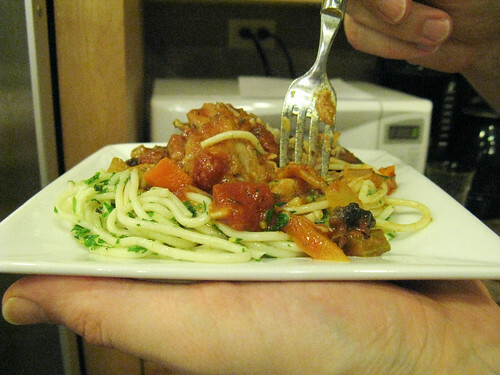 The final dish was a long-simmered chicken cacciatore, served over spaghetti noodles tossed with gremolata. 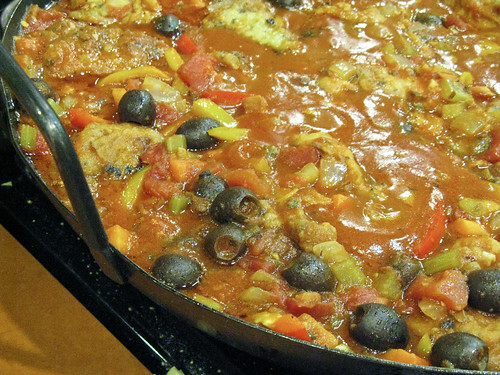 The chicken was panfried ahead of time, then nestled into a chunky sauce of mushrooms and tomatoes. 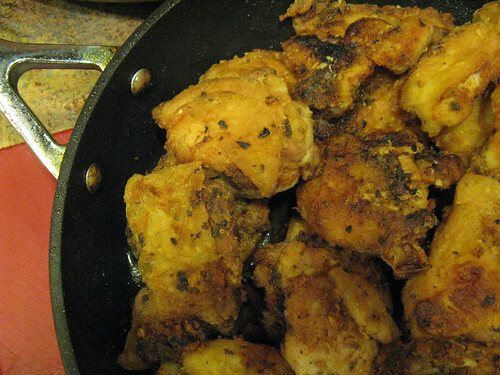 The whole thing simmered away while we were working on other things. Then, at the last minute, Peter chopped up a big pile of parsley, garlic and lemon zest, tossed it with an enormous quantity of spaghetti, and served the cacciatore over the noodles. Although I couldn’t manage any at the time, I was lucky enough to get to take some home. I ate it for lunch on Wednesday, and it was delicious. And, not surprisingly, very, very filling.